released October 12, 2013 by Platform West. Mike Brown, Ulf Larsson, Conny Laxéll, Lisa McClenahan, Marc Thomas, Liny Wood. Produced by Chris Laney, Anders Ringman and Lennart Östlund. Executive Producer : Mike Dalager. Music by Chris Laney, Anders Ringman and Lennart Östlund. Lyrics by Mike Dalager and Andrew Leman. 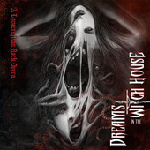 A concept album based on “The Dreams in the Witch House” (1933) by H.P. Lovecraft. Recorded at Platform Studios, Polar Studios, Stockholm, Sweden.